We have played Fluxx in the past and have really had fun with it. The company looks to change up their subject material to receive the most interest, and Stoner Fluxx is their latest creation. The game runs similarly to a traditional version of Fluxx but differs in terms of the subject matter. This means there are still rules (Keepers, Goals, Actions) or collections of cards that need to be received that will change the overall playstyle or rules of the game. Smoking and generally hanging out surround much of the subject material that is broached during a game of Stoner Fluxx. The game should only be played by those people that are of age and have any interest in smoking or other 420 friendly pursuits. I would venture and say that a number of head shops will be stocking Stoner Fluxx but a number of clued in toy and hobby stores may also carry the game. 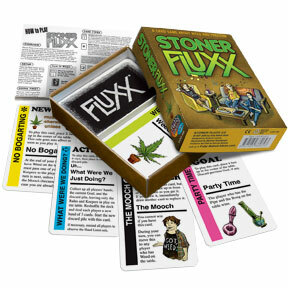 Regardless the game is fun for anyone that has played Fluxx in the past; Stoner Fluxx has enough in the way of rule information included that even those individuals that have not played the game in the past will be able to be familiarized into the game’s rapid format after reading the included rule card. Make sure to visit the Fully Baked Ideas website for more information about the entirety of their product lines, product releases, and other news about the company.